Just Julie B's Stampin' Space: Bear Hugs Valentine Set! This super cute Bear Hugs set is perfect for the baby bear in your life! 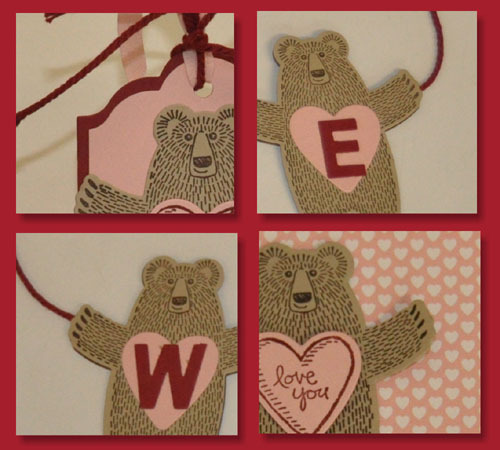 Featuring a pop-up card, treat bag, and banner, it is a great way to show your love on Valentine’s Day or all year round. The treat bag is a great size for cookies or candy. The banner is easily customizable to any length name. The pop-up card is quick enough to make multiples of while still being exciting to open. This fun trio would also make a great class or club project. This cute project was made by Yapha Mason, and you can get her tutorial when you subscribe to the month of January over at Craft Project Central.